Port Augusta today is a busy regional centre, and always has been with its central location making it an important meeting place for many and diverse Aboriginal groups who gathered to trade and exchange knowledge and skills. 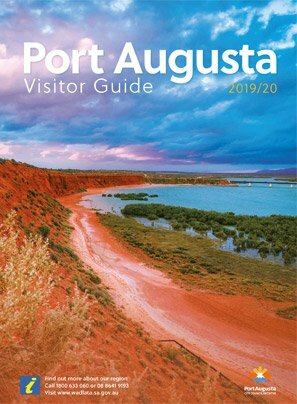 With a population of almost 14,000, Port Augusta has a long history as a transport hub, which continues today through its rail connections as a freight route to the north, south, east and west of Australia. The historic Pichi Richi Railway with its narrow gauge rail line from Port Augusta to Quorn showcases transport in a by-gone era. Beautifully restored steam engines take passengers on a memorable journey through the stunning Flinders Ranges with trains departing both Quorn and Port Augusta. In recent years, Port Augusta is taking steps towards becoming a green energy city, following the closure of its coal-fired power station in 2016. Bungala Solar farm is currently under construction, and is one of many green energy projects proposed in the Region. Sundrop Farms is an amazing success story on the City's outskirts and showcases how innovation can create new industry in an area it wouldn't have previously been considered. Growing thousands of kilograms of tomatoes in its four 10 acre greenhouses, Sundrop Farms uses desalinated water from the Gulf and solar thermal power to grow its produce. It is also a significant employer in the city. Tourism is also a signifcant industry and each year, visitor numbers to Port Augusta continue to grow. 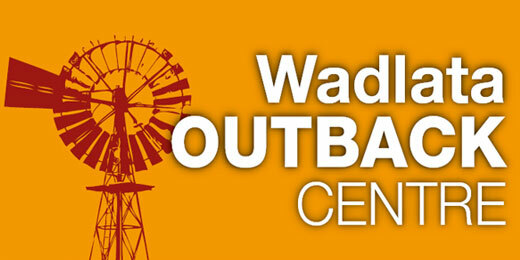 Its location on the calm Spencer Gulf Water, close proximity ot the Flinders Ranges and national parks, and its two major tourist attractions of Wadlata Outback Centre and the Australian Arid Lands Botanic Garden make it an ideal location for travellers. It's also an ideal location for outdoor expereinces with the gulf waters ideal for kayaking, and bike and walking tracks thorugh the city and along the coast. Captain Matthew Flinders, in 1802, was the first European to explore the area around Port Augusta. Forty years later pastoral leases extended from the Flinders Ranges north to Leigh Creek. It was the prosperous wool merchant and MP, Thomas Elder, who initiated the mid-1850s move to survey the harbour and layout the township. A wool store was set up near the beach, a jetty was built, then a second "Burgoyne" jetty- and over the next 10 years the town was established. Many of the stone hotel and churches so admired today were designed by prominent architect Thomas Burgoyne. The population boomed, as settlers came north in expectation of finding rich farming country. Small vessels delivered "tea and sugar" supplies to the Port. These were carted through the Pichi Richi Pass, or sent to the Western Plain, east through Horrocks Pass, or to the shores of Spencer Gulf and on to the arid north and west. Each September half a dozen 300-500 tonne seagoing ships took wool to the London sales. In 1864 the boom went bust when the summer 'dry' stretched into a devastating three-year drought. 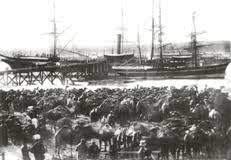 Inland transport stalled and, as an emergency measure, camels were brought in. A sad new industry emerged - the Boiling Down Works salvaged fat, hide and bones from the carcasses of starving stock. Despite the drought the wheat industry spread northward at fever pitch. The first 199 bags were shipped to Adelaide in late 1877 and by early the next year wheat was bound for London. With the coming of rail the Port's shipping tonnages quadrupled. The rail brought building supplies, consumer goods and more workers. Rail meant that pastoralists on large northern properties could get their cattle to market in days instead of weeks. The harsh, dry climate had won. Wheat was not a dependable crop and the number of ships entering the Port dwindled. Now it was rail's turn to drive the town's fortunes. Port Augusta was the right place to become the headquarters for a vast rail extension across the Nullarbor Plain to Western Australia. The Rail industry saved Port Augusta from the worst of the 1930s depression and when war came, this industry was crucial to the war effort. Bomber aircraft flew overhead, air-raid trenches were dug and from 1941 lookouts for Japanese aircraft were posted at the high water towers. Local rail workers were not allowed to enlist because they were maintaining an essential war industry. More workers were brought in. Following the war the town became a centre for light industry and the site of an electrical plant. It's future in power generation commenced with the completion of The Thomas Playford Power Station, known simply as Playford, in 1957 using coal railed in from the Leigh Creek Coalfields in the north of the State. The Northern Power Station was later completed in 1985 and had the capacity to generate 500 megawatts of electricity and for many years the stations produces about 40% of South Australia's electricity until their closure in 2016. Port Augusta also became known as a centre for outback distance education with the original School of the Air opening in 1958 at the Royal Flying Doctor base. A year later, when it moved to it's own headquarters, there was an enrolment of 100 students. Now this world famous education service for remote isolated children has entered a new age of technology, with children and families communicating and learning in a virtual classroom.